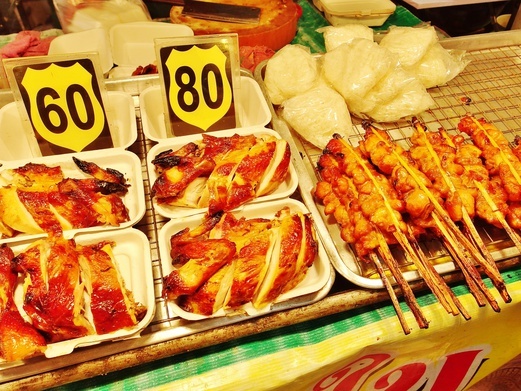 What to eat in Bangkok? You may wonder. 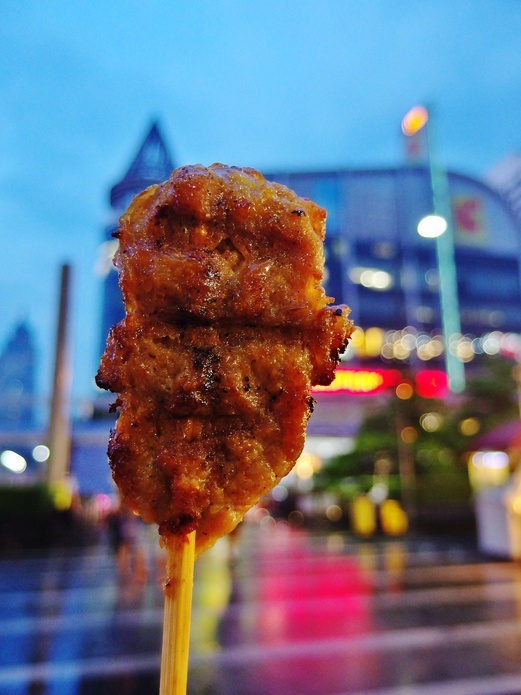 Thailand may be better known as the Land of Smiles but I’m sure many would agree that it is also the Land of Street Food and the perfect foodie’s paradise. 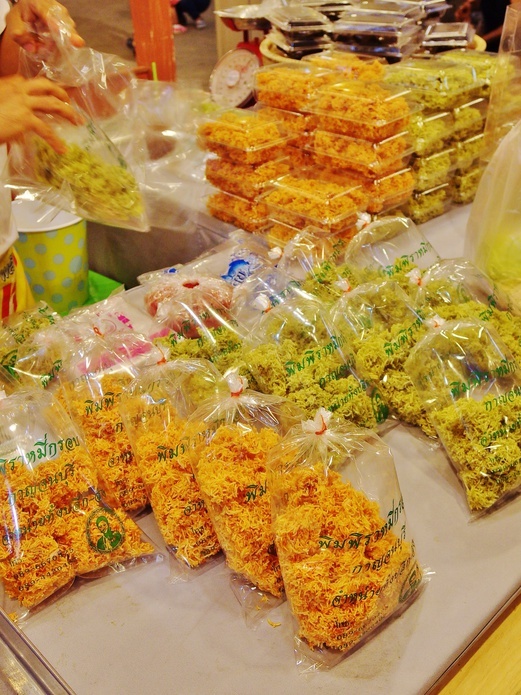 Every trip to Bangkok is always a mouth-watering one. And there is just no reason not to eat when delicious foods are always at reach no matter where you go. 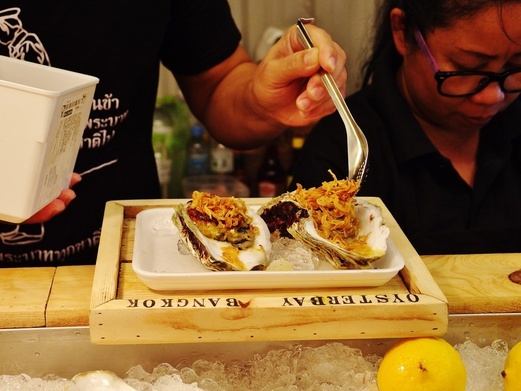 After trying so many dishes (seriously, we really lost count) in a week, we managed to come up with a list of 30 recommended eats in Bangkok. 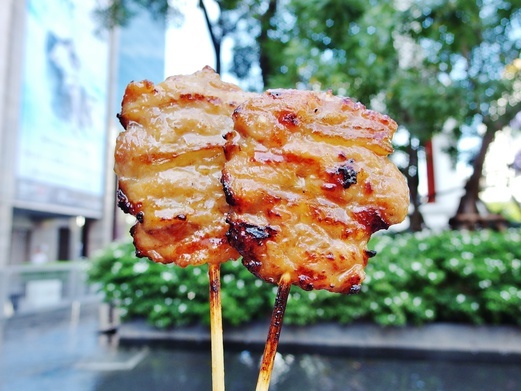 Most of these foods can be found along the streets or in casual-dining eateries of downtown Bangkok as well as at various markets like Chatuchak, Or Tor Kor, Pratunam, Talad Rot Fai Srinakarin and more. 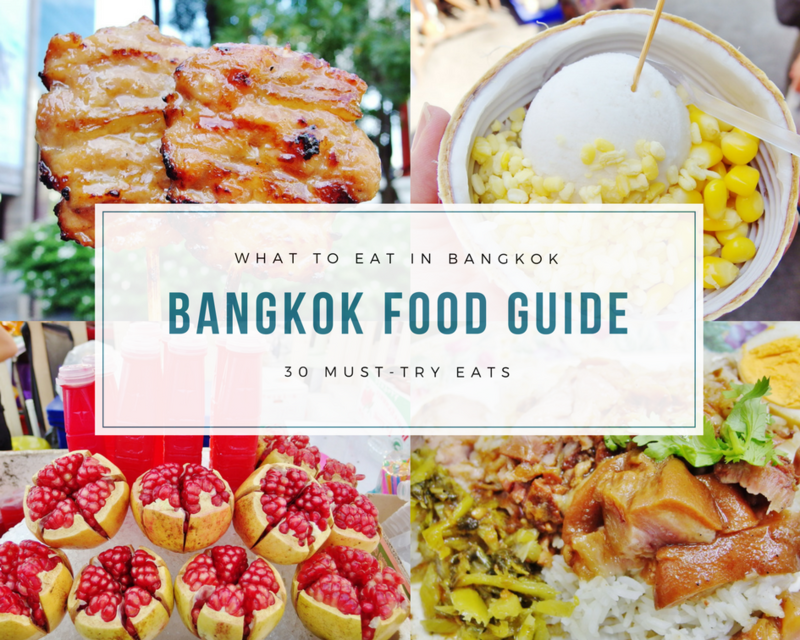 If you’ve never been to Bangkok before, this guide will come in handy to kick off your food-venture so you can keep an eye out for these delicious bites when you’re roaming the city. 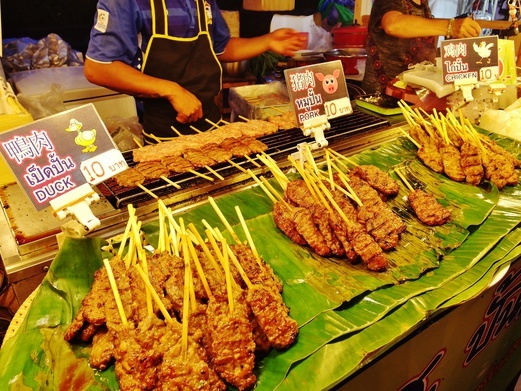 Tender, juicy and smoky barbecued pork slices on sticks. If I can only have one dish in Thailand, it has got to be Moo Ping. These Thai style pork skewers are beautifully marinated in a sweet-tasting sauce before going onto the grill. So tasty and flavoursome. Way better than the regular satay in Singapore. And they pair wonderfully with sticky rice too. There is also the Moo Yang which is similar to Moo Ping except that the meat is minced instead of sliced. Go for the Duck Meat Moo Yang for something different. 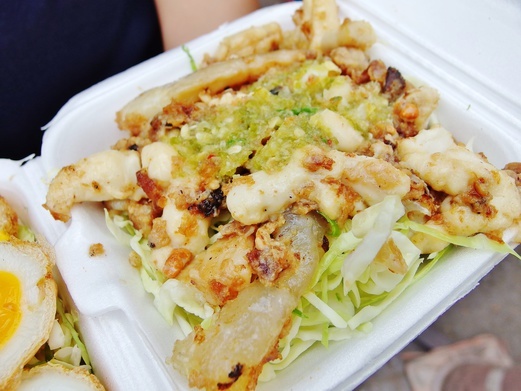 It’s not gamey at all and it’s also redolent of spices that are quite close to that of satay. Packed full of cholesterol but it’s worth every ounce of it. There’s nothing complex about this dish as the squid eggs are merely stir fried in oil but the green chilli sauce that is doused over the squid eggs is extremely piquant and appetising. The squid eggs also have a lovely melt-in-the-mouth texture. So moreish. Again, another cholesterol-laden dish. But who cares as we don’t eat quail eggs all the time. YOLO – so don’t worry, be happy. 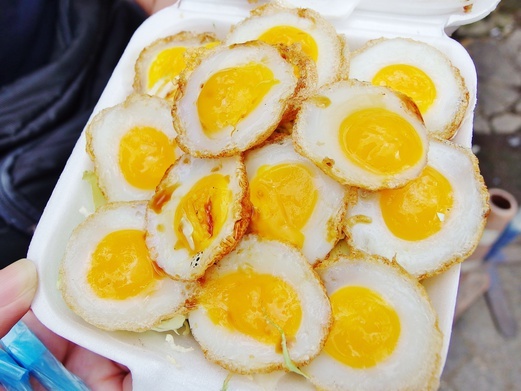 These are like mini (cute-looking) sunny side ups served atop a bed of shredded cabbage and seasoned with just a touch of light soy sauce so all you get is the all-natural eggy flavour. If you love eggs, you’ll definitely love this. Yum. No visit to Chatuchak Weekend Market is complete without a serving (or maybe two) of the famous coconut ice cream that’s served in a halved coconut shell. It includes two toppings of your choice too. 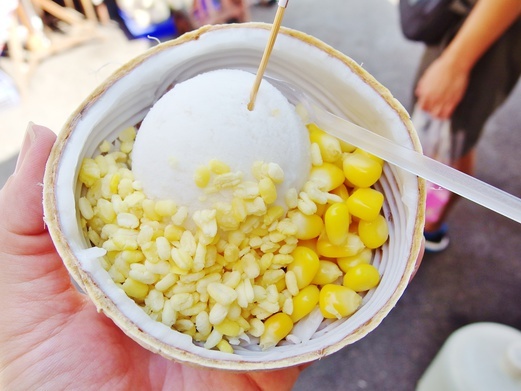 The ice cream is rich in coconut milk flavour. Very fragrant without being too sweet. And you can also scrape off the soft coconut flesh on the inside of the shell to enjoy. Definitely the perfect way to beat the heat. 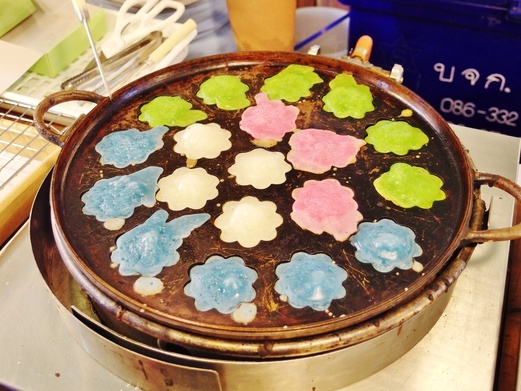 The traditional Khanom Krok Bai Toey actually refers to the green-coloured, pandan-flavoured pancakes. But this particular stall that we visited also served them in various colours and flavours like strawberry (pink), honey (white) and butterfly pea flower (blue). No artificial colourings or flavourings are used so everything is kept natural. These are like nyonya kueh with a pan-fried crust on the outside. Not too sweet either. Worth trying. 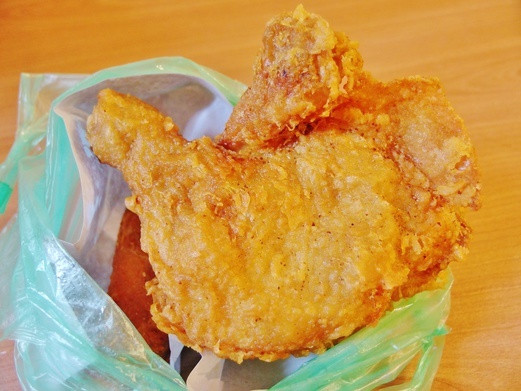 Nothing beats good old classic fried chicken like this. No heavy batters or coatings. Fresh-tasting frying oil. Crispy and crunchy exterior. Moist and juicy meat. Really reminds me of Granny’s fried chicken. 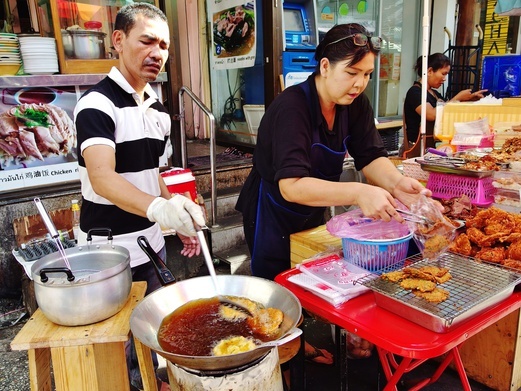 Most food streets and markets sell fried chicken but I particularly like the stall from Pratunam food street because the boss will fry only a small number at a time so every batch is guaranteed to be hot, fresh and crispy. Possibly the best power juice that’s packed full of antioxidants. Pomegranates are expensive to begin with so don’t expect a bottle of this to be as cheap as other drinks or juices. But it’s worth it. I mean, when do we even have the chance to drink such juice in Singapore unless you want to buy pomegranates and squeeze the seeds yourself. So sweet, so refreshing. Lovely. 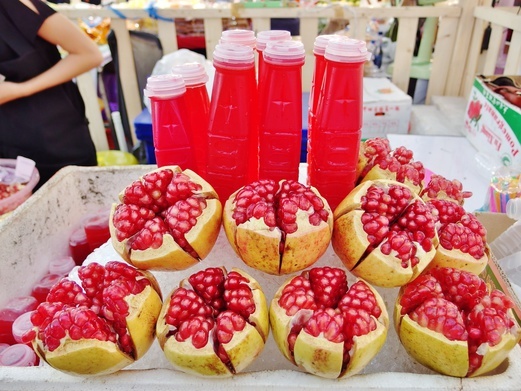 Just remember to pick a stall where you can see the vendor peeling pomegranates and squeezing the seeds to extract the juice because there are some who use ready-made ones that are not totally the real deal. 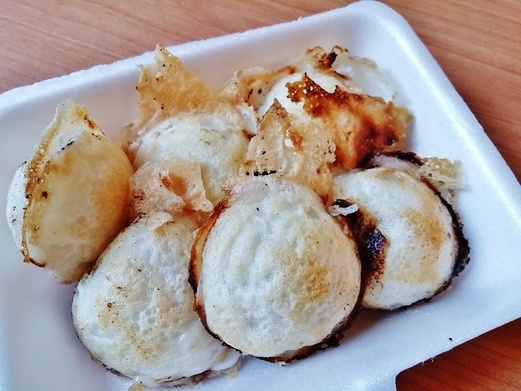 Khanom Krok are dessert pancakes made with rice flour, sugar and coconut milk. They are slightly crispy on the outside (sometimes with a crust too) and are soft and creamy in the middle. They somewhat resemble the takoyaki or ebelskiver (Danish pancake puff). Each ball is made of two halves combined. On the sweet side but very addictive. Just can’t stop popping them into the mouth. 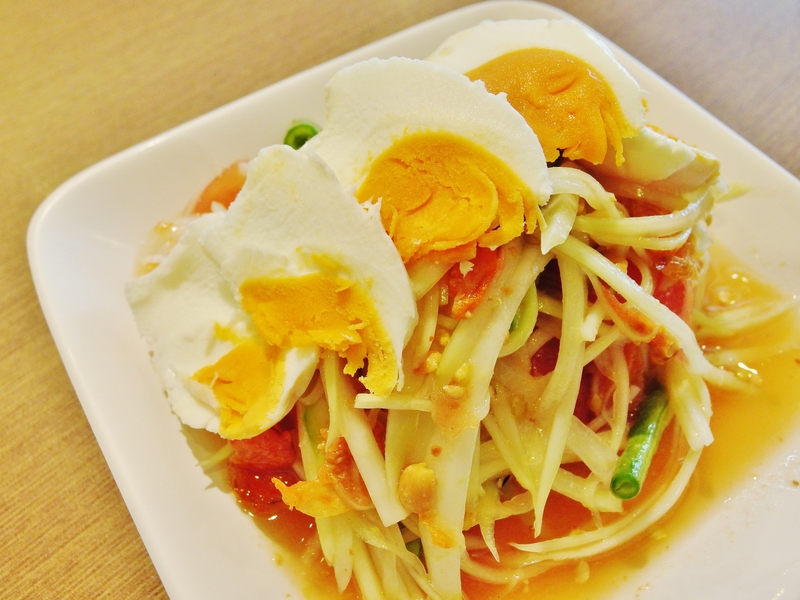 The green papaya salad is always one of the most well-loved dishes at most Thai restaurants. Crunchy shredded papaya in a refreshing, piquant sauce that really whets your appetite before you tuck into the rest of the meal. This version comes with salted egg but you can have it plain or with other toppings like brined crabs, pork sausage, crispy pork rind, etc. 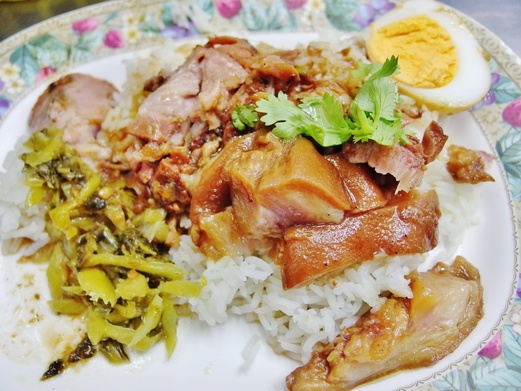 All the braised pig trotter rices I had tried in Bangkok so far weren’t the best I ever had. I still prefer the braised pig trotters from Ng Ah Sio and Ya Hua Bak Kut Teh in Singapore which are leaner but nonetheless very meaty and tasty. Despite that, the Thai style braised pig trotter is still pretty delicious especially when you get super tender meats with fats that just melt in the mouth – all soaked in a robust-tasting, flavoursome sauce. Served with preserved vegetables and braised egg on the side. Very satisfying meal. 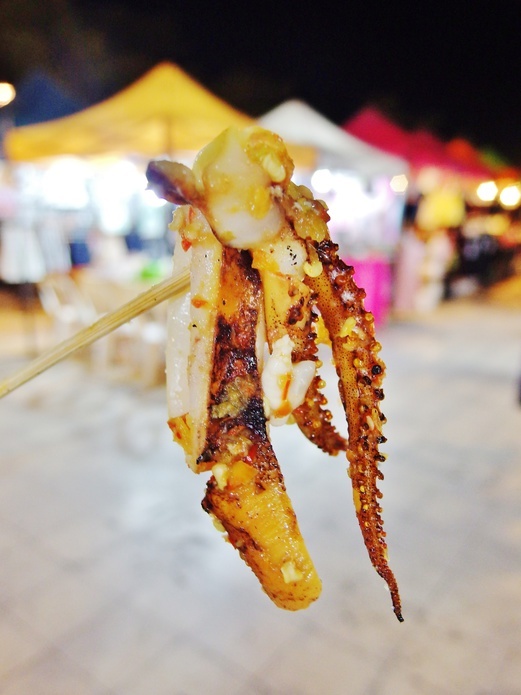 Juicy, tender squids that are grilled in whole and then priced according to their sizes. What makes this delicious is the accompanying chilli sauce that gives the real kick. Yummy snack to munch on while on the go. To be honest, I’m never a big fan of oyster omelette because a few mouthfuls of it make me feel quite jelat (cloying) easily especially when there are a lot of gooey bits in it. But I totally enjoy the oyster omelettes I had in Bangkok because they are eggy and are fried to a nice crisp (which also means a lot of oil is used). The oysters are also plump, juicy, clean and fresh. 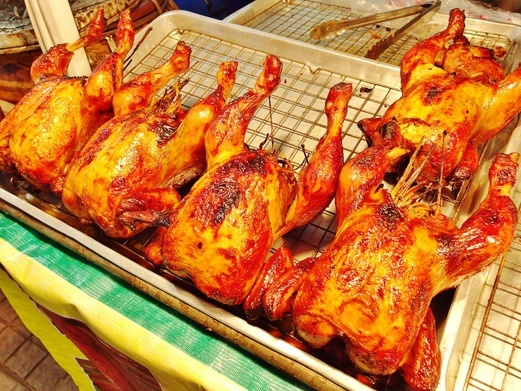 One of the most commonly found street food in Bangkok is the grilled chicken that is normally eaten with sticky rice. You can buy the chickens in whole or buy them in packets that are priced according to quantity. The cut chicken parts may look dry from the outside but the meat itself is actually very moist. It’s so tender, the meat will just fall off the bones. Best thing is, there isn’t much fat beneath the skin so you can enjoy to your heart’s content. 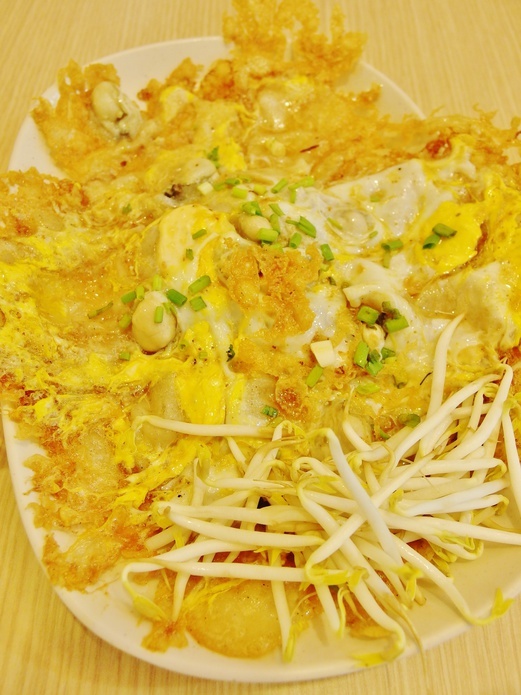 These are crispy crepes with cream and coconut shreds or egg threads. They taste like the egg rolls we will normally have during Chinese New Year. The cream is thick and sweet but the whole combination of textures and flavours work really well together. Two pieces per person is probably enough because it’s quite rich in flavour so share if you can. 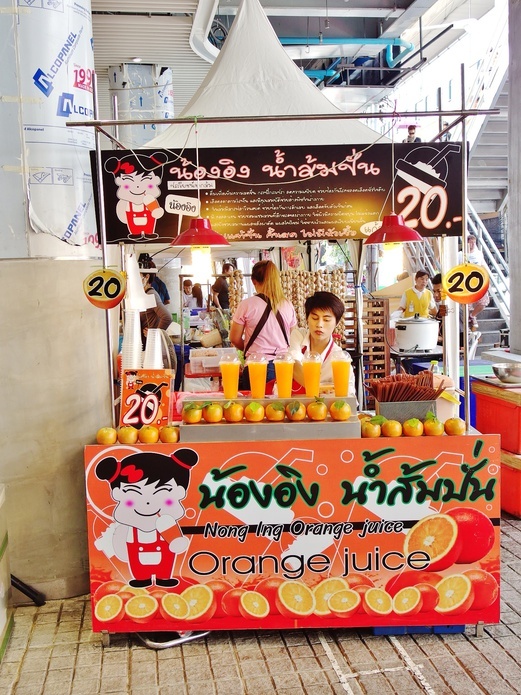 You can easily spot an orange juice kiosk in various parts of downtown Bangkok. But it is this particular stall that keeps me coming back. Because they use very fine ice which makes the orange juice here taste like a slushie. 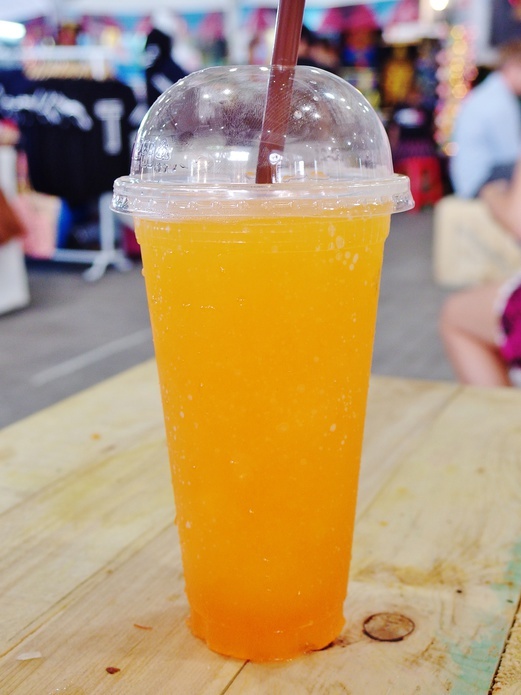 And it’s only 20 baht for a big cup of refreshing orange slushie. 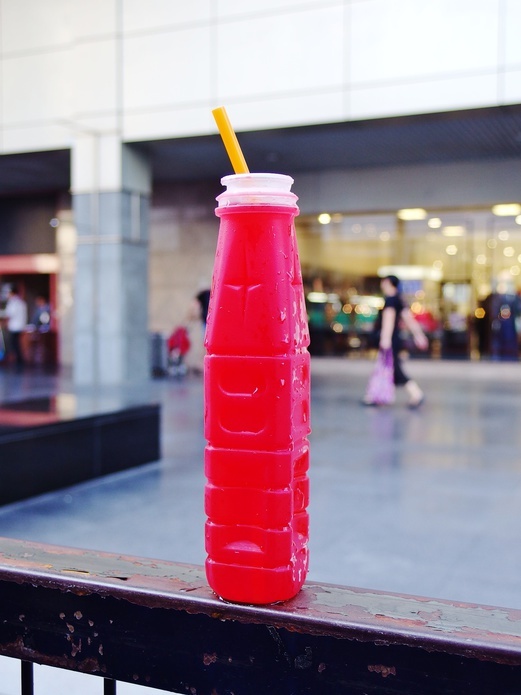 Best drink to have to combat the sweltering heat in Bangkok. If you’re wondering why the orange juice is in such a bright orangey colour, well, be reassured that there isn’t any artificial colouring in it. It is an all-natural refreshing juice. 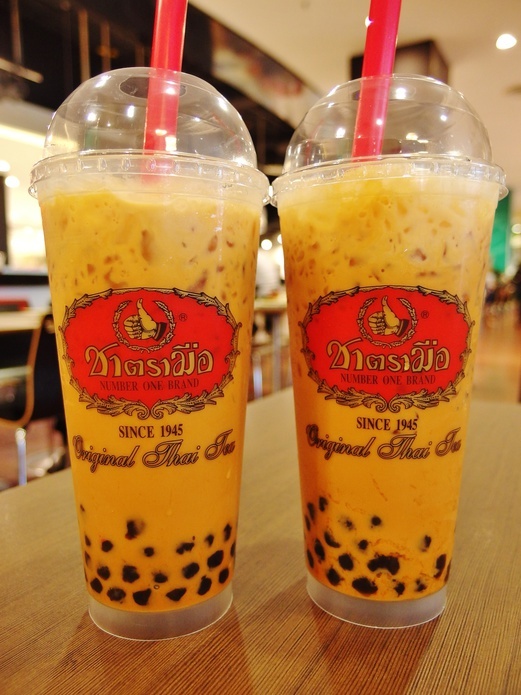 You can’t leave Thailand without drinking the ever-popular Thai Iced Teas that are available in both red and green tea versions. My favourite brand of Thai Iced Tea is Cha Tra Mue which has many outlets across Bangkok – in various malls and selected BTS stations too. They use Ceylon tea, condensed milk, evaporated milk and sugar for their concoctions. The tea flavour is very aromatic and really stands out. Overall, it isn’t overly sweet too. You must be wondering why I’m featuring the Japanese takoyaki in Bangkok because it’s not an overstatement to say that this takoyaki is one of the best I’ve ever had – probably on par if not better than some Japanese ones. 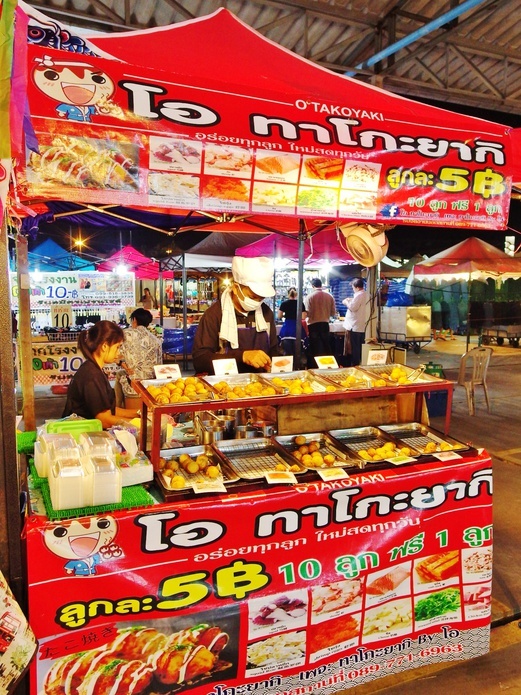 The recipe may or may not be as authentic as the real deal because this stall offers so many different varieties compared to the usual takoyaki flavours. However taste wise, it’s a winner. For just 5 baht a ball, it’s an absolute steal. 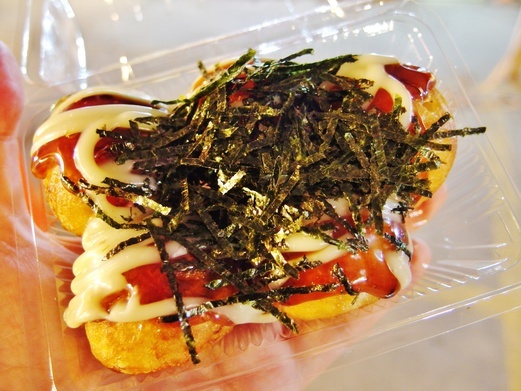 The outside of each takoyaki ball is very crispy. And the sauce is quite different too – more savoury than sweet – so moreish. Not exactly a Thai dessert but still worth having. 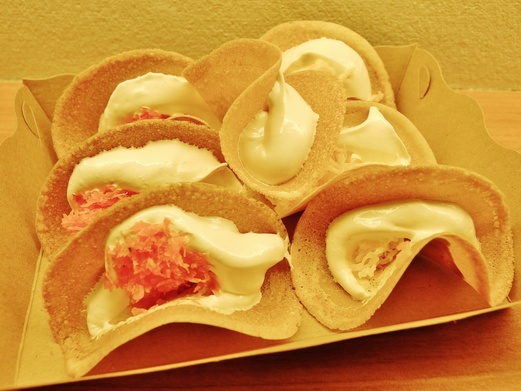 The crepes in Bangkok are not just big in size but are cheap and good too. There is also a good selection of toppings to choose from so you can customise your own crepe with whatever you like. I like mine with bananas, cashew nuts and chocolate sauce. 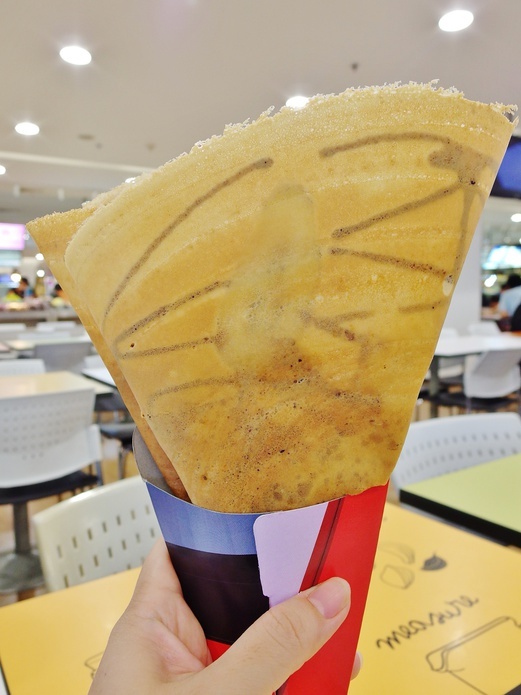 The exterior of the crepe is just light and crispy – so nice to munch on. Steamed rice skin dumplings. At first, I thought these dumplings were purely sweet desserts but after tasting them, I realised they were both sweet and savoury snacks. 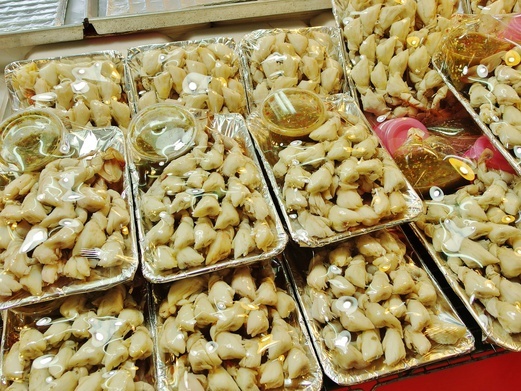 The filling is really similar to that of Beh Teh Sor (馬蹄酥) with a sticky malt sugar filling. There are ground peanuts, onions and minced pork meat in it too. These dumplings are paired with lettuce, coriander and fresh chillies – really like that freshness and crisp. One of the best food finds at the train market. 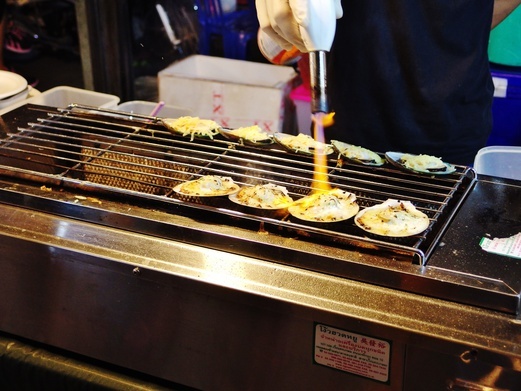 Grilled shellfish that are prepared only upon order and then torched on the surface to give it a slight smoky flavour. 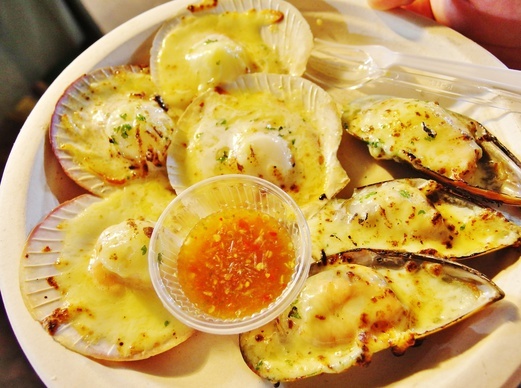 This 100 baht set consists of 4 scallops and 3 mussels. The shellfish are so fresh, juicy and sweet. There is some cream (tastes like tartar sauce) in the cheese mixture so it’s really creamy, rich and cheesy. Delicious. A must try. These are definitely the best Thai fishcakes (30 baht/bag) I’ve ever had and they are from a street food stall in Pratunam. The flavour of the fishcake is really outstanding because you can taste the spices in it that give a lot of depth and body to the otherwise humble snack. Also, they always fry the fishcakes in small batches so regardless of the time of the day, you’ll always get fresh-tasting fishcakes. Highly recommended. Or rather kueh kueh in our local language. 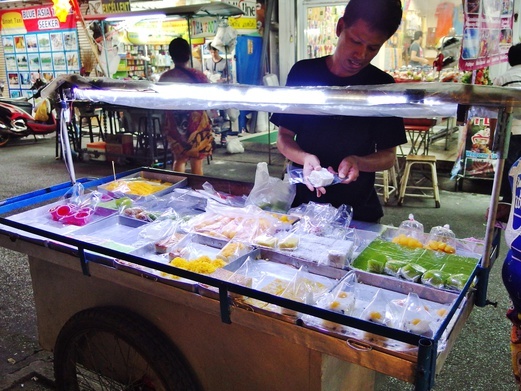 This vendor never fails to amuse me because he always set up shop on the same street as my hotel (Patra Boutique Hotel) at night and he will always tell us that his kueh kueh is Number One in Thailand, haha. I don’t know about that because I haven’t eaten enough kueh kueh to be able to compare the standards but I must say he has a good variety of different kueh. Each piece cost just 10 baht. The kueh are quite similar to what we can get in Singapore as most of them are made with pandan, coconut milk, banana and even agar agar. 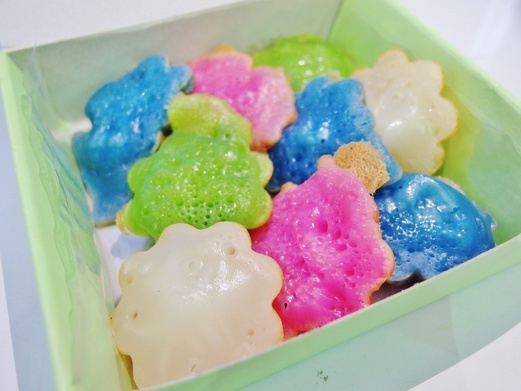 There is also the kueh lapis but in pandan version so it’s green in colour. 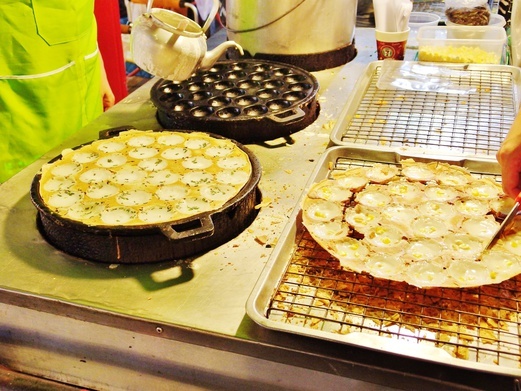 If you like kueh, come check this stall out. We checked out different durian stalls at Or Tor Kor Market but found the lady boss at Ta Toy Durian most friendly and approachable. A very down-to-earth vendor who wasn’t pushy at all. She even let us sample the Monthong durian – an entire seed even though it was the most expensive durian breed (100 baht per 100g). So generous of her. 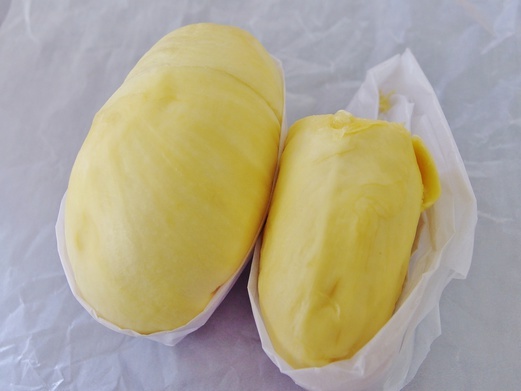 The Monthong durian is very different from all other durians I’ve tried previously. The texture is quite spongy on the outside but very creamy on the inside. It is like jackfruit with a soft centre. The durian aroma isn’t very pronounced. The first bite is very alcoholic and then it will gradually mellow. Seeds are surprisingly very small. This Monthong durian is really very meaty. If it’s your first time trying durian, this is a good one to start with because it really tastes more like a fruit with its pleasant sweetness. If you’re looking for a good Monthong durian, come to Or Tor Kor Market and look for this particular stall. We were told that the best times to come would be May, June, September and October. I really love Or Tor Kor Market. Besides durians, you can also find a huge assortment of cooked seafood here such as crabs, big river prawns, regular sea prawns, fish and more. The seafood is either grilled or steamed which is the best way to enjoy their freshness and natural sweetness. Just look at how meaty these crab legs are. Nicely steamed. You can either eat them plain or dip them into the accompanying chilli sauce which is piquant and delicious. I am so glad to have found these wonderful oysters at Artbox. 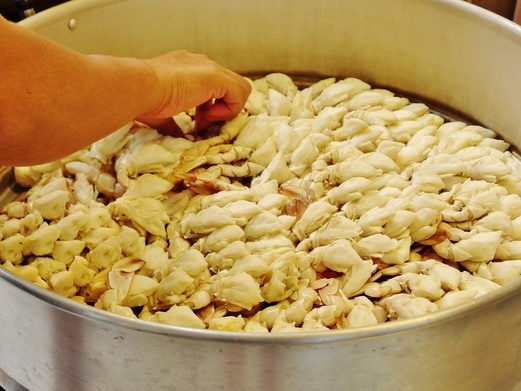 Freshly shucked on the spot and served with a dressing of your choice. Looks really amazing and tastes fantastic as well. The oysters are so plump and juicy and the sauce dressing really balances up that original briny flavour of the shellfish. 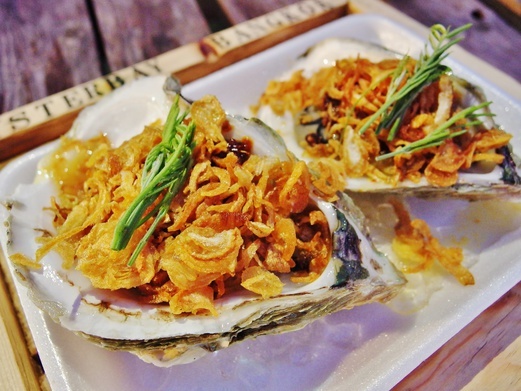 Raw oysters have never tasted this good. 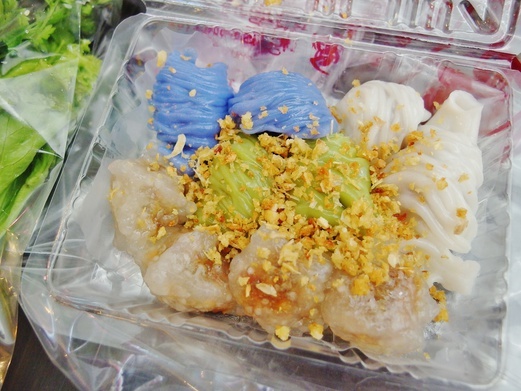 One of the top Thai desserts to try. I’m so hooked onto mango sticky rice that I will eat it at least once or twice a day since my favourite stall is just right outside my hotel. I like mine with big, thick chunks of sweet, juicy mango. The sticky rice is neither hard nor soft and is perfectly flavoured with a tasty coconut milk sauce and an added fragrance of split mung beans. 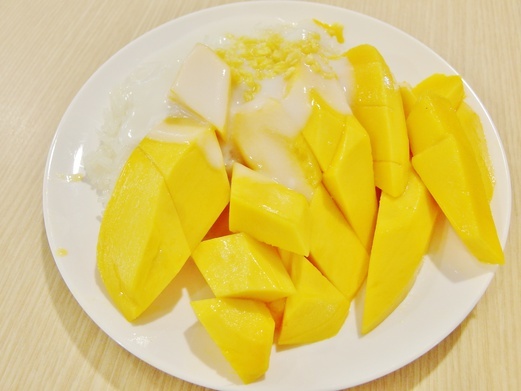 If you’re interested to try making mango sticky rice, check out my Mango Sticky Rice Recipe. Definitely the healthiest food in my entire list. 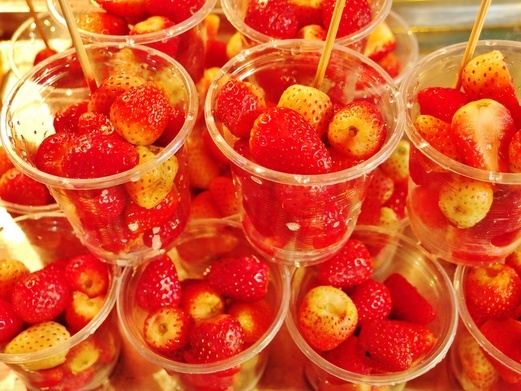 I came across a strawberry stall at Victory Monument. Looked tempting so I bought a cup (30 baht) that came sprinkled with chilli sugar. The strawberries were incredibly sweet and juicy. And I really liked that hint of spiciness that seemed to bring out the sweetness of the berries more. Nice. 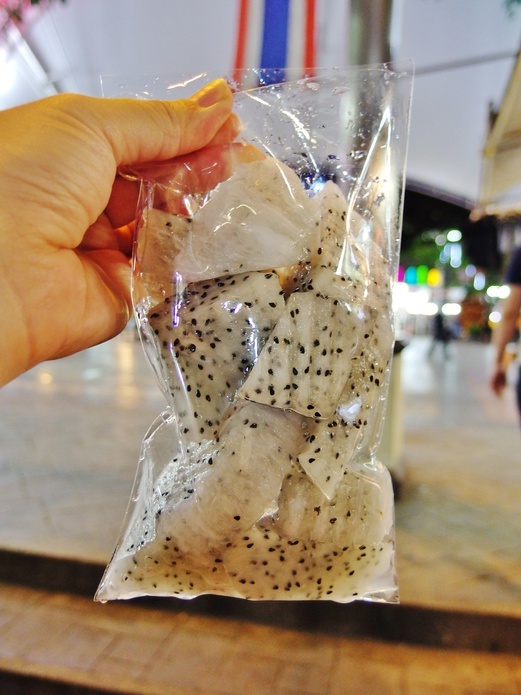 In fact, at most fruit stalls on other food streets, all the tropical fruits are just as delicious because they are so sweet and juicy just like this bag of dragonfruit (20 baht). It really motivates me to consume more fruits and I will always buy a few bags of different fruits every night as supper. My first time trying this. 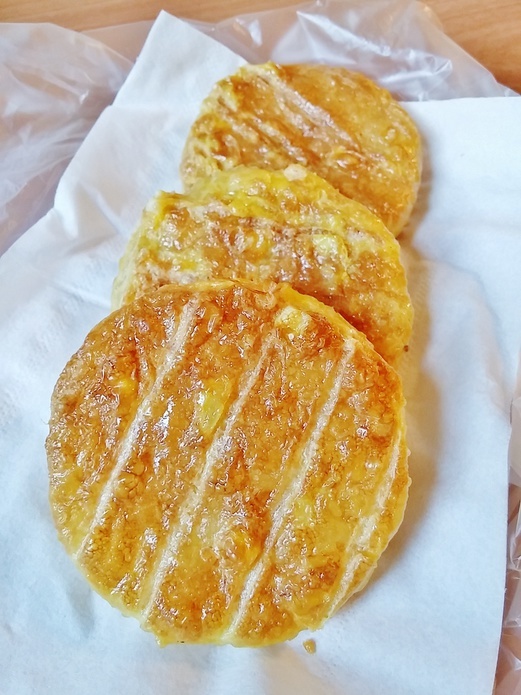 They are actually sticky rice cake patties that are coated with egg and then grilled over fire. Almost like a french toast style of rice cakes. The rice is quite plain but overall it is eggy in flavour. Outside is crispy and inside is quite soft. 3 pieces for 20 baht. Worth trying if you haven’t had this before. These rice noodle snacks are sticky, crispy and fragrant. The orange looking ones even contain spices that really lift the flavour. Great snack to munch on the go. Can even buy as food gifts. Low fat gelato on sticks from Annette i tim Tuk Tuk. 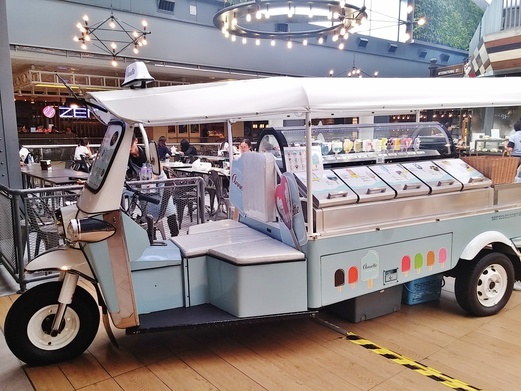 You can easily spot this cute Tuk Tuk in various places around downtown Bangkok such as Novotel Bangkok Platinum Pratunam, Pantip Pratunam, Chatuchak Weekend Market, EmQuartier and Asiatique The Riverfront. 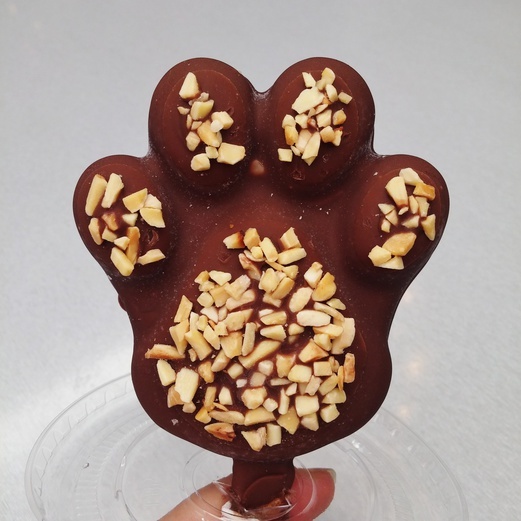 This is Chocolate & Banana which comes in a cute paw shape. So instagrammable. 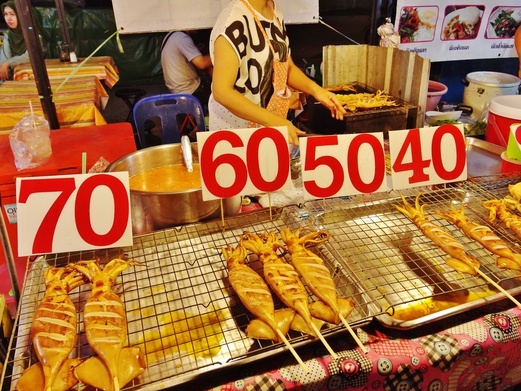 At 80 baht a stick, it’s definitely considered an expensive treat by local standards. And seriously, except for the appearance, taste-wise, they are just like any other regular ice cream. Worth trying if you’re into photographing pretty food. I will be travelling next month to another foodie paradise and will also be staying at a durian farm as it’s going to be the prime durian season. And I’m going to eat durians to my heart’s and tummy’s content, haha. Can’t wait to share my stories when I’m back so stay tuned for more.